Reaching an audience has not been a problem for the Science Booster Club Project. At the rate we’re going, we will have provided informal, engaging educational experiences on topics such as climate change and evolution to more than 5,000 people by the end of February. That’s not bad in-person impact for a program that has been running less than a year! It turns out that lots of people want the kind of accessible, public experiences the Science Booster Club Project provides. In so many ways, from numbers to engagement to positive comments, the events have been successful. However, most of these people don’t want to pay for them. Over the last nine months, we’ve attempted to raise money at all of our events—and we’ve received voluntary donations of less than fifty cents per person on average. I’ve heard from many participants that since they already pay taxes for public schools, they’re already giving enough money to science education. I think this shows how little the average person understands about where their taxes go. Based on what science teachers tell me they need for their classrooms, there isn’t a lot of spare cash floating around the average public school science department. Unfortunately, appeals from these educators don’t seem to inspire people to give. A few weeks ago we finally had a fundraiser that brought in enough money fund a teacher micro-grant cycle. Based on the success of “Corridor to the Stars”, we’ll be able to grant requests from two local teachers for the types of lower-cost equipment that don’t totally break the bank, but you wouldn’t want to buy out of pocket. How did we inspire attendees to open their wallets? We supplied alcohol! Admission to the event included wine at a tremendous markup. When I realized that our second-most successful fundraiser (moneywise) involved expensive but delicious hot dogs, I began to see a pattern. 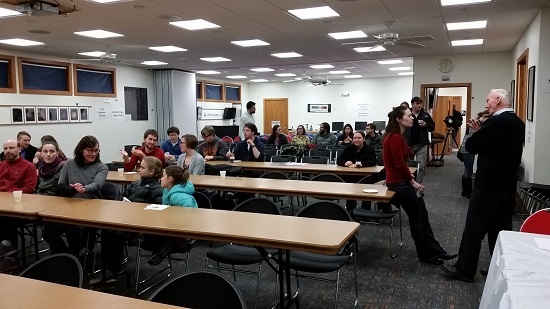 Apparently, people who are interested in science might not be interested in purchasing t-shirts or raffle tickets, but they are definitely interested in food and drink. I don’t know that I consider this discovery particularly inspiring, but I hope it will be useful going forward with the project. The other way the Science Booster Club Project has been able to get money to fund teacher grants has been through grants from local STEM businesses. We’re fortunate to be located in a region where many STEM businesses are flourishing, such as Rockwell Collins, one of our best supporters. Grant-writing has generated more total donations than slinging booze, but when we consider how to scale up the project to a national level, I wonder how many communities have people interested (and trained) in writing grants to get money from local businesses. In terms of skills and confidence, grant writing is more demanding than selling refreshments. So moving forward, what am I to do? We would like to hire more staff for the project, but where is that money going to come from? Grants? If we move towards a grant-based model of funding, to a certain degree we are likely to reduce direct community involvement. People should want to give to causes that directly impact their community. If our vision for the Science Booster Club Project involves building community support for teachers, a direct funding model is a great way to show community support. I’d rather not rely on overpriced wine and hot dogs, but I’m not sure how to inspire community members to give. Do you have any ideas? Share your thoughts in the Comments section below.